Every once in a great while my friend Tina and I are able to browse our local library together. When we do I always leave with a double bag full of books. She simply walks down the shelves and says "You need to read this one and this one and oh, have you NOT read this one..." She is an amazing reader, far more prolific than me, and has a knack for picking great books. 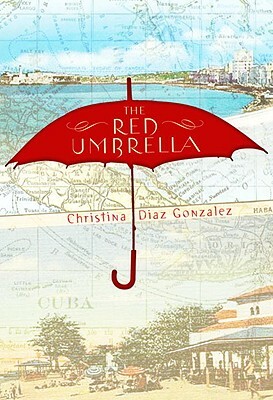 On our last library visit she handed me The Red Umbrella and it was the first one I pulled out of the library bag. Cuba 1961: two years after the Communist revolution, Lucía Álvarez still leads a carefree life, dreaming of parties and her first crush. But when the soldiers come to her sleepy Cuban town, everything begins to change. Freedoms are stripped away. Neighbors disappear. Her friends feel like strangers. And her family is being watched. As the revolution's impact becomes more oppressive, Lucía's parents make the heart-wrenching decision to send her and her little brother to the United States—on their own. I was moved by both parts of this story. I didn't know very much about Cuban life before Castro or after and Gonzalez's work gave me a look into this history. I found it interesting how the revolutionaries worked so heavily on Cuban children, especially young adults, to carry out their "for the good of the common people" message. Learning about Operation Pedro Pan was new and one I was happy to read about. Thankfully, the U.S. took part in this exodus of children from Cuba to the States. As Lucia and her brother are sent away her friend, Ivette, stays in Cuba and attends Castro's camps to learn how to be a good revolutionary leader. I liked the balance between Lucia's Nebraska story and Ivette's Cuba experience told through her letters. Once in Nebraska, Lucia and Frankie, while missing their parents, also must cope with how difficult it is to come to this country and be an outsider. The Baxters are an older couple, living on a farm, in Grand Island, Nebraska-the polar opposite of Cuba, especially in winter. Luckily, even though it is rough, and they miss their parents, life becomes comfortable with the Baxters. Lucia and Frankie find friends at school and do well in their new environment. I was going to be wearing hand-me-downs. Used clothing. I'd never had to do that before. We always bought the very latest fashions. Ivette would be mortified to see me wearing these clothes. Authors often speak of a story emerging, just asking to be written and this is probably true of Christina Diaz Gonzalez's story based on recollections from her own family. I feel richer having read Lucia's tale and look forward to others by Gonazalez.